Note: Competitors participating in the Underhand Chop or Standing Block Chop are not eligible for this event. Reminder: Competitors must either wear chain mail in conjunction with CSA approved steel toed footwear or the metal/aluminum guards securely fastened. Corral must be a safe distance from the spectators and only competing athletes, event judge and timer are permitted inside. Two (2) team members must each quarter a bolt of wood. The wood should be between 46 - 51cm (18 - 20in) in length and a diameter between 15-20cm (6 - 8in) and be poplar. 2" diameter painted dots on both bolts must be in a different color and must also be a different color then the block number on the opposite end of the bolt. A total of eight (8) separate unattached full length pieces with paint on one end to complete this event; four (4) from each competitor. Each competitor must use an unmodified, conventional axe. One per competitor. Mauls are not permitted. The second competitor may not begin until the first competitor has completed their split. If they do, a DQ will result. Once the second competitor begins their split, the first competitor cannot split again. 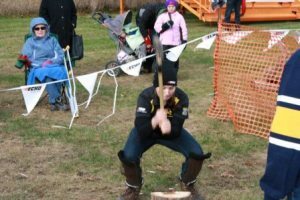 Competitors may not use their hands and or feet while the axe is being swung to split the block. Competitors may not use their hands and or feet to separate split pieces; however, hands may be used to stand the block upright. Starting prior to GO will result in a disqualification. The axe must be on the block until GO or in the case of the second chopper , until the 1st chopper signals they are done. If protective gear becomes dislodged at any time during the event, it must be immediately repaired and time will run. If not, a DQ will result. Competitors are not permitted to touch the splits until the judge makes their decision. If touched, a DQ will result. Time will stop when the second competitor signals time to the judge.